Once the powder magazine was completed, work began in earnest on the magazine keeper's house. The two-story house was situated outside the walls of the fort. 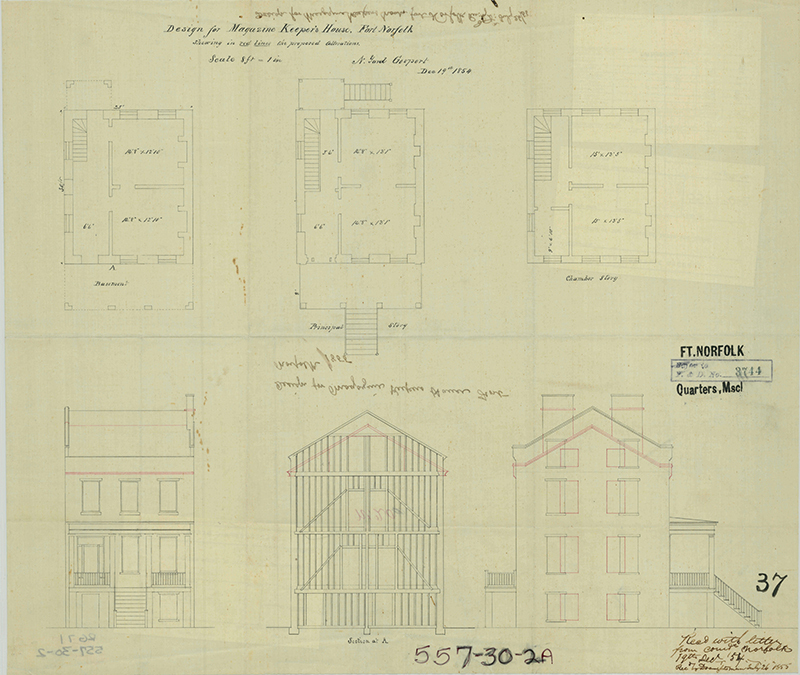 On December 19, 1854, Commandant Breese sent plans of the keeper's house to the Bureau of Yards and Docks (BY&D 1854) (see above). "Nearly all the inside wood work is completed and ready to be put up," he reported. The "cutting of the stone work" was also under way (BY&D, Letters Received, Box 159, vol. 2, Breese to Smith, December 19, 1854). Apparently, the stonework and interior decorations were fashioned before the was later used as the headquarters of the U.S. Army Corps of Engineers. In February 1942, at the beginning of United States involvement in World War II, the magazine keeper's house was demolished to make way for temporary office buildings for the U.S. Army Corps of Engineers (Kim Memorial Library 1942).